Fantastic! Started on time, worked 5 days a week from morning ‘TIL evening and finished project early. Quality and pride of workmanship. Issues were resolved quickly and efficiently. Everything went like clockwork. All trades were hard-working, professional, courteous. Every evening equipment and surroundings were left clean and tidy. Will definitely use M.D. builders again! Thank you Mike, Michael(s), Roman and all who contributed. We hired mike and his team to renovate our home in preparation for sale. Mike's team was great. We had them renovate 2 bathrooms, redo tile in our basement, patch our front hall tile, and repair a rotting window sill in our basement. The contractors worked long hours to make sure the job got done in less than 2 weeks and we're incredibly friendly. We have three dogs, which was a concern for us during the renovations. The contractors were amazing with the dogs, letting them out during the day, playing with them after work, and protecting them from the renovation debris. It was a huge relief to know that they weren't afraid of the dogs, and that the dogs weren't then disturbing them during the day. 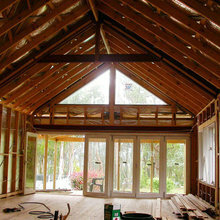 We have built several homes in the past and are very familiar in dealing with construction. 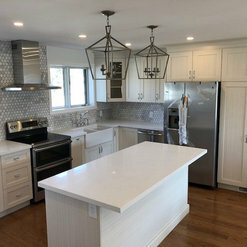 Overall, working with mike and his team was a great experience and we would use them again for any other Reno projects we may have in the future. This is the second project we have hired M & D Buildings for. Again, we are very pleased with the professional services and high quality of workmanship provided by this company. 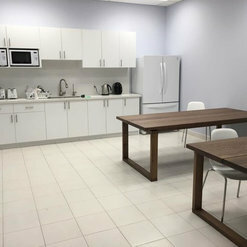 Our project was completed on time and within budget. Mike is a pleasure to work with, trustworthy, and truly cares about doing the job properly. 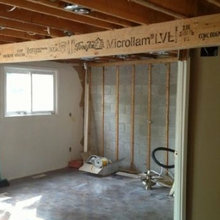 We had M & D Buildings remove our load-bearing wall between the kitchen and dining room. They built a very strong support beam above the ceiling so there are no visible seams, allowing the entire area to be open to sunlight; they transformed a very dark, closed-in room into a bright, fluent area. 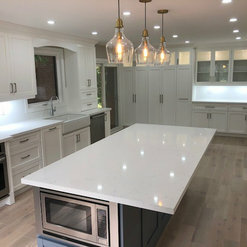 Everyone who has visited our home since the renovations have commented on the excellent placement of tiles, the expert custom cabinetry, and the precise quartz countertop installation. We also had them put potlights throughout; these were installed with careful planning to maximize the look and functionality. 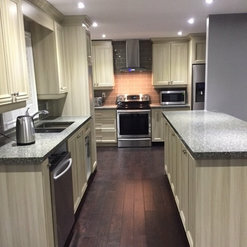 All of the tradespeople in Mike's team are professional, courteous, and will take the time to explain what needs to be done to meet your requirements, and address any questions you might have. I highly recommend M & D Buildings. 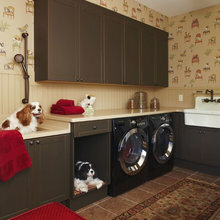 M & D Buildings added a powder room and renovated our main bathroom and we are very pleased with their work. We now have two rooms in our 40+ year old house where the walls are plum/straight! The team that worked on our house (Michael, Mike and Roman) arrived on time every day, helped me to understand the little things I hadn’t thought of so I could make the right decision for us, were very conscientious and delivered quality workmanship – and the job was done early! It is hard to trust someone to come into your home and create your dream. We will not hesitate to get M & D Buildings to do our next renovation. Thank you to Mike, Michael, Mike and Roman. We highly recommend M&D Buildings. Not only did their work meet our high expectations, it was also done on time and within budget. After suffering a bad experience with a previous company, we were cautious about proceeding with another company. Mike put us at ease from the moment we met him. 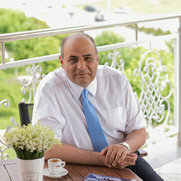 He is very professional and knowledgeable, but also very honest and dedicated, which is rare these days. He responded quickly to any concerns and/or questions, offered excellent suggestions, and came to visit the job site on a regular basis. We are so grateful to have found Mike and only wish we had found him sooner. Mike assigned Les to complete our bathrooms project. We recognized immediately that Les takes pride in his work and expects excellence from his crew. Les was very easy to work with, drawing upon his vast knowledge and experience to help us with ideas and best solutions. Les and his crew were very professional in their interactions and cleaned up at the end of each day. The highly skilled crew was focused on customer satisfaction and ensured the job was done right. 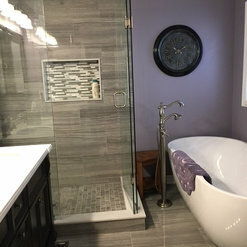 Our main bathroom was done in less than 3 weeks, involving a complete gut, replacing the tub with a full-size glass shower, and moving the toilet to accommodate the new layout. It looks amazing. Our master ensuite was more challenging as it had a full-size tub and a very tiny shower, which we wanted expanded. It was completed in 4 weeks, much quicker than we had ever expected. This involved a complete re-design of the original layout, with a smaller tub and large shower. The result is more beautiful than we could ever have imagined. We are absolutely thrilled with this company. 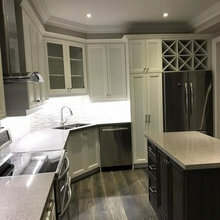 We have already hired M&D Buildings to do our main floor and kitchen renovation in the new year, and will definitely hire them again for any other future work. We recently performed a complete master en-suite remodel by M&D buildings and are very happy with the end results. From initial consultation to final inspection, it has been a great experience. We initially looked at 6 contractors and M&D was not the most expensive, nor the cheapest, but we felt like they provided the greatest value of everyone we saw. Their reviews and portfolio were the best of the bunch. Mike is very easy going which removes much of the stress from a major remodel. He was extremely responsive, responding to texts, emails and phone calls immediately. The project was completed in 8 days, which was ahead of schedule and on budget. The team was very professional, laying down tarps and plastic over the floors and furniture. Each day ended with the team removing all tarps and vacuuming the entire site and common areas. The team arrived on time every day and worked 12 hour days. They were all very professional and address any concerns we had. 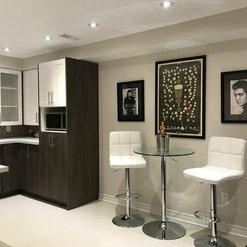 The trades people are very skilled and you can tell they take pride in their work, focusing on the details to make sure everything is done right. 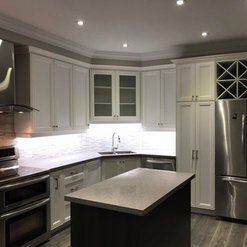 The end result is a gorgeous reno, which we are very happy with. I highly recommend M&D Building if you are considering a renovation. We look forward to engaging Mike and his team for our future renovations. I don’t normally write reviews but I felt compelled to in this instance because finding an honest and skilled general contractor is a daunting task. I highly recommend Mike from M and D Buildings. Mike is not only a general contractor, he is a Professional Engineer with a Master’s Degree. We purchased a 1970 house that needed massive renovations. Our whole house was brought down to the studs and Mike handled everything like a true professional. The house had asbestos, mold, plumbing and electrical issues, and Mike calmly walked us through everything. He is extremely knowledgeable. He removed load bearing walls without a hitch. 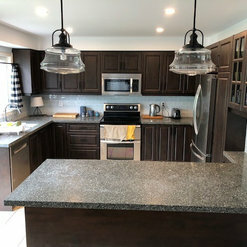 The renovations included the remodelling of 2 kitchens, 3 full bathrooms, laundry room, 2 sets of oak staircases, new 200 amp electrical panel, all new doors and windows, etc. I cannot stress how happy I am with Mike. You will not find a better contractor. He is reasonably priced, his contract is clear and detailed, he responds promptly to texts and calls (within seconds), and he completed our house ahead of schedule (10 weeks). I have recommended M and D Buildings to all my friends and family and I encourage you to call Mike too. Don’t hesitate! You will not be disappointed. 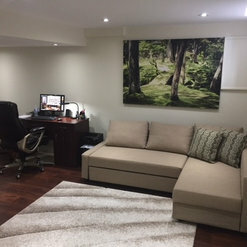 I contacted M&D for a quote consultation for my mothers basement in Mississauga, in addition to a few others. As of now we have yet to make a final decision but it was important to me to come and leave a review on the experience I have had thus far. M&D was prompt and to the point, they arrived to view the space in need of repair and provided a quote in a timely fashion. When we had extra questions or quotes they maintained communications and provided those as soon as possible. A very pleasant experience where the initial stages are concerned!! Working with Mike from M & D Buildings was a excellent experience. Because of continuous changes in plans (on my part), we had to keep going back to the proverbial drawing board but Mike and his team were always very patient, understanding, reliable and overall, a pleasure to work with. He is also very open to suggestions, straightforward while giving many options to achieve a goal. I can't thank him enough for all his patience and hard work with our own project. I would highly recommend him to both family and friends who are requesting services. Peter T.
I would HIGHLY recommend M & D Builders to anyone and everyone! We had our upstairs bathroom renovated in 4 days. This was such a huge relief after the rocky start we had with our first contractor. Suffice to say, our first reno experience ended on a good note because Mike and his team came in and saved the day! The crew was professional and skilled, knowledgeable and easy to work with. Mike was fantastic to oversee the project daily. 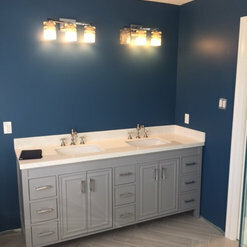 We love our new bathroom and cannot thank M & D Builders enough for their amazing work! When it's time to reno our kitchen, we will definitely be calling on them again! 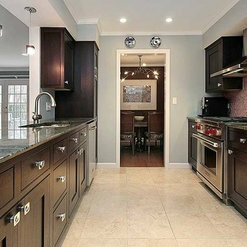 Commented: Kitchen Cabinet Size - Help!As long as the kitchen cabinets is a custom made then you can do what you want. 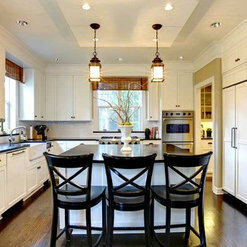 I mean you can play with the measurements of the cabinets or door sizes to get the symmetry that you want. Commented: Window trim and curtains or no?I think you have to have a curtain though!